This painting, titled Radish Bunch, was inspired by a scene which caught my eye while shopping. The radishes depicted here, along with many more, were lined up in multiple rows on a produce shelf, roots facing out, creating a large mass of vibrant red and white balls with swirling, reaching roots. The regimented order of the bunches along with the lyrical motion of the roots made the radishes look like a jubilant and explosive orchestra, sending out strains of twisting and turning music in every direction. I purchased a bunch and placed it in a wooden box which I have used in several paintings. Shutting out all the light in the room except for that which came from one window, created a spotlight effect on the radishes, while the surrounding darkness further highlighted the motion of the bright roots. 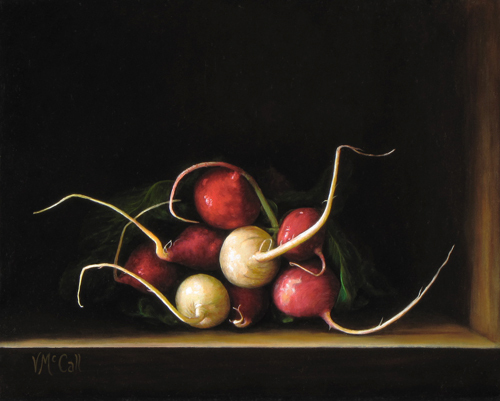 This small painting celebrates the exuberance of that little radish bunch in its own unfurled solo moment. This is such a unique & intriguing subject, beautifully rendered. The radish roots seem curious to discover new life, like a nest of straining baby birds. Oh, you’re right! Lovely comparison.